At some point, we've all purchased something whose results were, er, questionable, and didn't live up to our expectations or deliver the results we were so boldly promised. But no more! For the sake of you and your hard-earned money, The Huffington Post Canada Style team is putting the latest products to the test every week. How To: Make sure you're standing over a sink or flat surface and put a small amount of the loose powder on your hand. Avoid wearing your day clothes (or night outfit), just in case the white powder falls onto your clothing. Rub the powder into your roots or hair ends and watch your hair transform from greasy to smooth. What We Thought: If you're like me, your hair is destined to be oily. I often forgo conditioner or anything moisturizing for my hair. I also stay away from gels and hairspray. 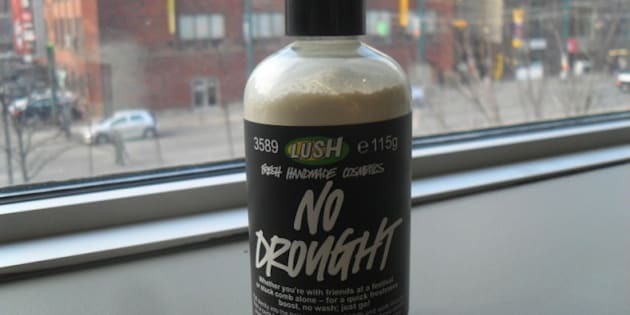 I wanted to use dry shampoo to save time and to avoid washing my hair everyday. For the most part, it worked -- and because it's LUSH, it smells fantastic. The Downfalls: The dry shampoo works -- but not as much as you may want it to. It's great for quick touch-ups on bangs, roots or areas on your head that collect a lot of oil. But if you use too much in one area, your hair colour -- my black hair at least -- turns greyish. Also, because it's a loose powder, it can be very messy. Tips: There is no replacement for washing your hair with regular shampoo and water, but this product is great if you want to avoid washing your hair everyday. Also, if you want to avoid the "grey hair" look, start by sprinkling the powder on your hands and patting it into your hair instead of directly onto your locks themselves. Final Remarks: This powder is definitely a win if you're looking for a way to keep your hair smelling fresh, and a tad bit drier throughout the day. It also solves the problem of oily bangs. Do you have something you want us to test out? Let us know what you thought on Twitter.